It can be easy for growing organizations to get caught up in the influx of data and information. In this episode of Mastering Innovation on Sirius XM Channel 132, Business Radio Powered by The Wharton School, guest Gaurav Dhillon, Chairman & CEO of SnapLogic, emphasized two key insights to make strong decisions and to better lead organizations: nailing product-market fit and scalability. Throughout his founding experiences at Informatica, Jaman, and SnapLogic, Dhillon learned the importance of balancing both the seen and the unseen. With data integration services, SnapLogic aimed to offer the benefits of data literacy to all enterprises, not simply tech titans like Google or Amazon. 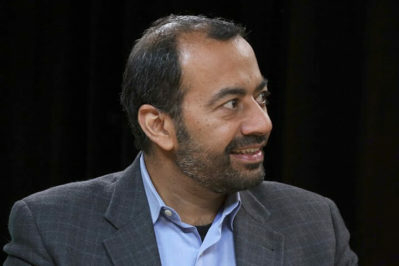 Dhillon recognized the growing necessity for enterprises to make data-driven decisions, but he also underlined the irreplaceability of human sentiment in many of these discussions. Overall, his insights revolved around the people, whether the customers or the business leaders involved in the process. Saikat Chaudhuri: You’ve had CEO and founder next to your name in the past, and clearly, you’ve been in this space, broadly speaking, for a while now. Tell us a little bit about Informatica: how you started this business from scratch, seeing the opportunity, and then built it into an established enterprise that was really one of the forerunners and pioneers in that age. Gaurav Dhillon: Well, thank you. I had help. I had a wonderful co-founder. I was not the brains of the outfit. I wasn’t smart enough to be the engineering guy, so they booted me upstairs. Saikat, I’ll make a full and frank confession: my talent is finding people who are more talented than me. If you boil it down, what do CEOs make? They make decisions. And the most important decisions are who’s on the team and who’s off the team, if you have to do that. Who’s on the team is the most important decision. We were blessed as, in our 20s, we were able to build that business out of a garage into a very successful public company. I was also fortunate to get some very capable investors: people who had funded Larry Ellison and Bob Miner at Oracle, a company of which I can see the towers from my window; Business Objects in Europe, [founded by] Bernard Liautaud and Denis Payre; and Informatica with my co-founder and myself. We had some wonderful people who came to us with capital, and in a sense, I earned my business spurs from mentorship and hard knocks. In the arc of time, I would bend that arc towards those two lessons. Most of them have to do with the humans around you. Chaudhuri: Gaurav, you make it sound so easy. What were the challenges that you faced in trying to build a company in a new and evolving space? Dhillon: Oh, boy. Just looking at my scars here, the frequency of these scars is usually around two subject matters, possibly three. I would say team building. I’ve been blessed. I would say my parents, and being the eldest child and grandchild, gave me this sense of confidence about people that has really stood me in good stead, but that is a gift, I think. What I’ve had to learn is two areas of building a business. The first one is product-market fit. That is a very, very slippery slope. Most infant mortality in the entrepreneurship world happens there. You have an idea? That’s great. Can you get the idea to resonate with a market opportunity big enough that it produces a business? That’s not so easy. Unfortunately, most product-market fit comes from having tolerance for pain and integrating around a core idea. We can do research till the cows come home. We can be, as we say in the software industry, dogfooding, which is: will the dog eat the dog food? You can wonder about that. You can look at that, but you have to actually put it in front of the dog to find out. I’m not an expert on the consumer side. I dabbled in it. I’ve had some investments in that area. But on the enterprise side, which I’ve been fortunate to have some success in, I’ve learned that if you listen and you have a breakthrough idea, you’ve got to have something that is radical. Henry Ford famously said, “If we listen to our customers, they would say faster horses.” I don’t think he was saying, “Don’t listen to your customers.” His point was your disruptive innovation, your radical innovation is going to come from within. But to make it work, to get product-market fit, particularly in a business-facing function, your listening skills have to be on amazing display because they are telling you, “If you do this, we will buy more. If you do that, we will buy less. If only you could do this, you could not only sell it to me, but also the pharmaceuticals companies next door, my brother-in-law who works in the railway, my cousin who works in the airlines, etc.” When we think about building businesses, I’ve learned to have great listening skills, to take bold innovations into product-market fit exercises, and to be patient. Chaudhuri: Go after something big, the radical disruptive innovation, and at the same time, remain open, but also flexible and adaptable to keep on adjusting strategy, technology, and organization in order to pursue the idea. Dhillon: Precisely. In other words, your strategy doesn’t change much if it’s good. Execution needs to be flexible because inflexible execution can be problematic and potentially fatal in the early days of a business before it’s cashflow positive. That’s one hairpin bend, and for many, many companies, that is the ceiling they never break through. The other one, of course, is scaling the business. You have product innovation. The dog’s eating the dog food. Maybe the dachshunds like it, the Alsatians like it, and the mastiffs like it. Now, the question is, how can you get the other city, province, state, or country to like it, and so on? Scaling is actually an area where people who have scaled businesses can come in very handy. This is actually a skill that you can hire for. Product-market fit, virtually impossible. You just have to bear and have grit to make it through product-market fit. Having awareness that that could kill you probably adds 20 IQ points, but you’re going to have to go through that on your own. Scaling the business is better understood. Those are portable skills that are at work. For sales people, feet in the street equals dollars in the door. That’s well understood. You can hire somebody from an industry like yours. If you have a same-store model – although I wonder if retail will ever be what it used to be – mainstream retail, then you can find store managers. If you have a restaurant idea, you can hire people who’ve run restaurant chains. On scaling, I would over-rotate towards bringing in talent that has done it before in a recent, relevant way. Those are the two, from my point of view, Saikat. I may be oversimplifying or potentially have entrepreneur amnesia about some of the harder bits, but those stand out. Product-market fit and scale: those are the big ones. Gaurav Dhillon is the Chairman and CEO of SnapLogic, overseeing the company’s strategy, operations, financing, and partnerships. Dhillon is an experienced builder of technology companies with a compelling vision and value proposition that promises simpler, faster, and more cost-effective ways to integrate data and applications for improved decision-making and better business outcomes. He is the co-founder and former CEO of Informatica, guiding it through a successful IPO and global expansion to become a leading software enterprise. Prior, Dhillon held management and engineering positions at Sterling Software and Unisys Corp.
Somina Lee, thank you for your blog post.Really thank you! Awesome.